We would like to invite you to our 2014 Community Appreciation Day! 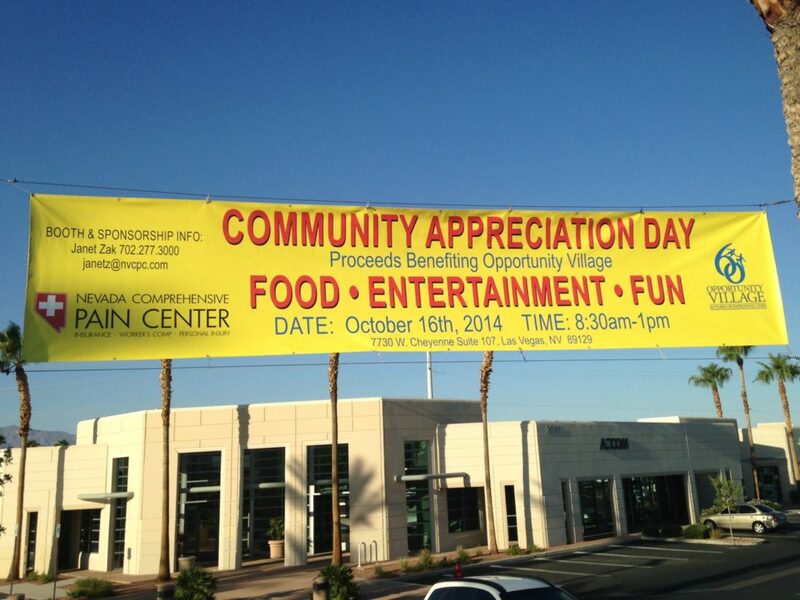 On Thursday, October 16th, Nevada Comprehensive Pain Center ( NVCPC) presents its “2014 Community Appreciation Day” benefiting Opportunity Village from 9 a.m. to 1 p.m. It is NVCPC’s way of saying “Thank You” to the community for all its support, also an opportunity for vendors to showcase their products, or services, and network with (NVCPC) CEO, Administrators, Dir. of Marketing, Physicians, Nurses, and staff. Event Address: 7730 W. Cheyenne Suite 107, Las Vegas, NV 89129. Touring the new (NVCPC) Summerlin facility will begin at 9 a.m. At the “2014 Community Appreciation Day”, an estimated 300 healthcare professionals, seniors, current, and former patients will interact with over 30 vendors/sponsors, local politicians, and celebrities. Entertainment will be on going and provided by local artists. Breakfast will be from 9 a.m. – 11 a.m., and attendees will be served donuts, fruit, and coffee. Lunch will be from 11a.m.-1p.m. and guest will enjoy sub sandwiches, fruit, vegetables, and water. Complimentary “Vendor Only Meet & Greet” will be held @ BJ’s 10840 W.Charleston Wed.6-8p.m., Oct 15th.